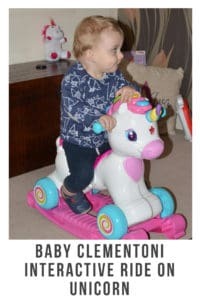 The Baby Clementoni ride on unicorn is three toys in one. It’s a rocker, a ride on and an activity centre. For toddlers 12 months – 36 months. Which makes it the perfect toy for both of my children to enjoy. As they both fit into this age categories. The main body of the unicorn comes in one piece then you have to attach the wheels, put together the rocker section and attach some of the stickers. Word of warning don’t try to put this together when you have a very excited child with you. As they will help themselves to the stickers and try to help you. So unfortunately some of our stickers are in the wrong places. Which does really annoy me but the kids aren’t bothered at all. 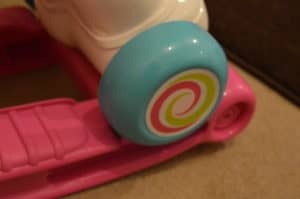 The wheels go together pretty easily and the rocker section simply clicks together then has some screws to screw it in place. You do need to use a screwdriver for these screws. 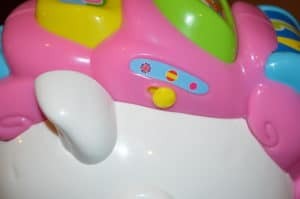 Once assembled the rocker attaches and detaches with ease. Both of mine prefer it without the rocker on so this part isn’t used a lot. Although Alby still needs to learn how to go forward on it. His very good at going backwards but does get annoyed when he gets stuck in the corner of the room. What I didn’t realise to start with is that you can have the sounds on the activity centre in both English and Spanish. I did think I was going a little crazy when I first heard it. Ava being that bit older than Alby does benefit from this feature. I have heard her chatting away and saying the odd Spanish word. Which she would have only learnt from the Unicorn. Along with Spanish children can also learn letters, numbers, animal names,sounds and colours. 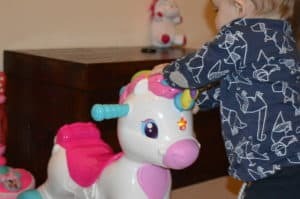 Alby loves the light up star on the front of the unicorn and tries to press it in all them time. 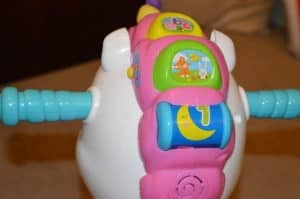 He also likes the section on the back of the unicorns head where it has the spinning section. As this then makes the music play and the lights come on. Ava just loves getting about on it. Her favourite thing at the moment is playing shops. So she asks me and Jordan what we would like from the shop. 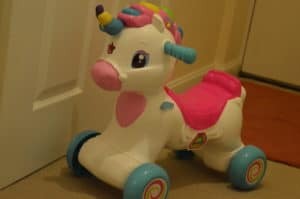 She then gets on her unicorn and off she goes to get it us. 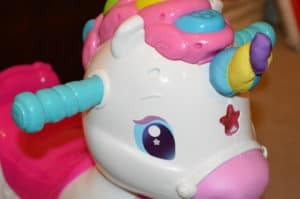 I also really like the fact that the unicorn’s horn is squishy as this adds another element in. Children can touch and feel the soft fabric. The other positive to it being soft is that it wont take anyone’s eyes out. Both of my children play rough and Alby has taken to trying to go after Ava on it. So I’m glad I don’t have to worry about him poking her with the horn. Overall I think this is a fantastic toy for children. I really like the fact that both of mine can play with it as most toys are normally to big for Alby and don’t stimulate Ava enough. 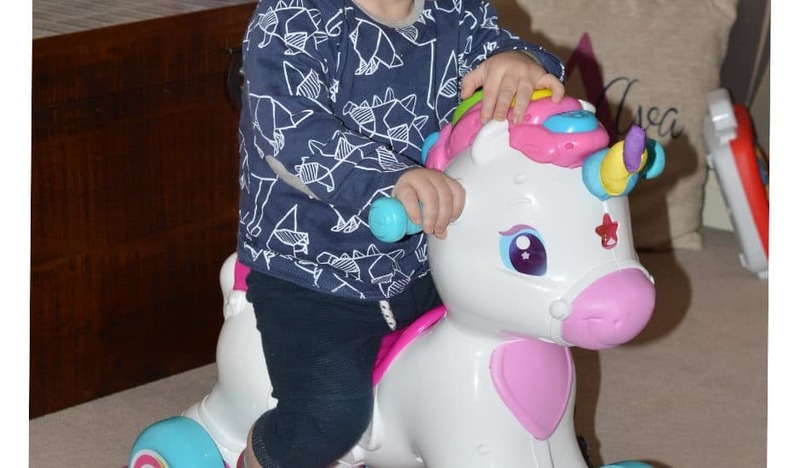 I do think that maybe Ava is a little bit big for it as her legs are quite bent when using it even though she is within the age bracket for it. Although she doesn’t seem to be bothered by it. I think for you to get a lot of use out of it then I would suggest its better for 1 year olds as it can grow with them and be used more. I love the fact that it includes Spanish into the music and sounds. As Children are like sponges when they are young so the more we try to teach them when they are younger the better. 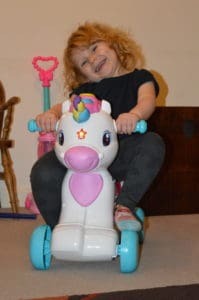 Like I said earlier Ava has started to copy some of the Spanish words which she would have only learnt from the Baby Clementoni Ride-On unicorn. 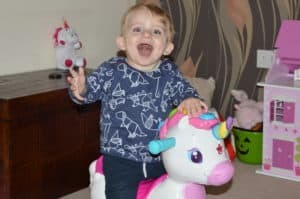 Alby has also taken to using the unicorn as a walker helping him to take some steps across the room.